And there you have it: the incredibly long title! It's actually a phrase from the Ministry's song "Everyday is a Halloween", which I'm going to add to the end of this post. I did choose this song because I strongly identify to the lyrics. If you google them you can probably guess why ;>! Anyhow.. Today I attended to a mini-meetup which Elina organized. I had a such a great time and you're going to see the rest of the photos of the meetup later when I get them from Elina. I only post my outfit which I wore at the end of the meetup ( I changed hats lol :D). Thank you Elina and everybody for a lovely day! I hope I'll see you soon. Guess who's been watching vampire movies again? 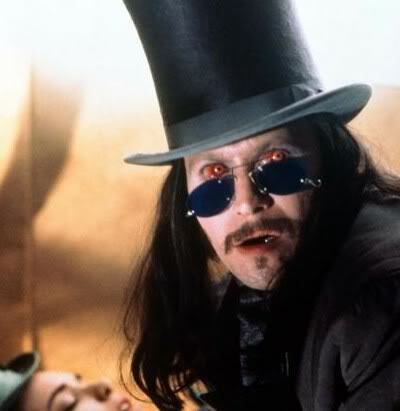 I think I look like Dracula from Bram Stoker's Dracula. staying up all night long, like a true vampire does lol. Hehee kiitos! Porukka sanoo että oon ku John Lennon mut en suostu hyväksymään sitä, Draculan suostun :DD.